Americans pride themselves in their knack for innovation, and nowhere has America’s can-do attitude been more apparent than at the supermarket. Need a cheese that is virtually indestructible? Want to find a way to stretch a pound of hamburger into a hearty main course for a family of five? Hard pressed for time to throw together a home-cooked meal? In the early decades of the twentieth century, and from the world wars to the cold wars, food producers and everyday dreamers met these challenges with the same ingenuity and resourcefulness that launched the country to the moon and back, with groundbreaking packaging, new technologies, and improvements on Mother Nature. 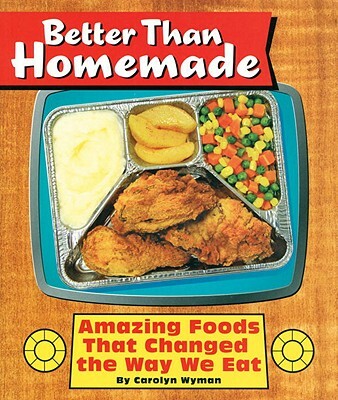 Better Than Homemade is food biographer Carolyn Wyman’s freewheeling and entertaining cultural history of the innovative packaged foods that changed the way we eat. With dozens of archival ads and original product shots of Hamburger Helper, Kraft Macaroni and Cheese, Minute Rice, Coffee-mate, Green Giant Canned Peas, Lipton Cup-a-Soup, Pillsbury Crescent Rolls—and many more revolutionary products—Better Than Homemade highlights the fascinating stories behind the food inventions; the histories behind the brands and icons that have become synonymous with them; the jingles that have made them such a large part of our popular culture; and the recipes that have tutored generations of homemakers and comfort food master chefs. Carolyn Wyman is the author of Spam: A Biography and Jell-O: A Biography. Her nationally syndicated column, “Supermarket Sampler,” appears in more than one hundred newspapers nationwide. Her writing has appeared in the Boston Globe, the Christian Science Monitor, and the Los Angeles Times. She writes, heats, and eats in Philadelphia.